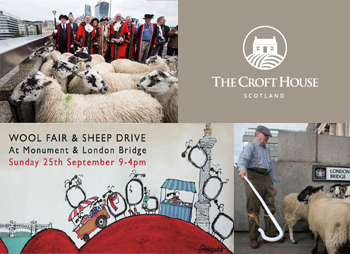 The Croft House is looking forward to participating in London’s first Wool Fair on Sunday 25th September 2016. The fair accompanies the traditional London Bridge Sheep Drive staged by the Worshipful Company of Woolmen, one of London’s oldest livery companies. We will join other woolly brands and urban street food vendors for a great day out. Situated about 300m from the north end of London Bridge, find us at stall 11 in the middle of Monument street. We’ll be just a stone’s throw from the 62-metre-high Monument to the Great Fire of London of 1666 which started in Pudding Lane. The fair runs from 9am to 4pm. We hope to see you there!